In the verse, Konami (little wave), is written with a different character for 'wave' than is used these days. The modern character can also be seen back at the time of the Unyoshi too. It is most likely that Konami, along with Okidomari, Tako, and Sezaki are all organized as part of the Nonami area. Sezaki and Nonami can be found in the Fudoki, so it can probably be assumed that 'Konami' can be included within the limits of 'Nonami'. Furthermore, while the current shrine location is Aza Hiratasan, it was previously in Maeda. The old shrine in Nonami was also enshrined in Maeda. 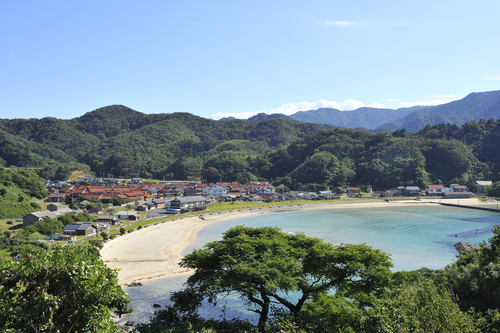 The curious thing is, Nunami shrine in Nonami, according to the Fudoki, was described as " Nonami beach. There is a shrine in the east." Clearly suggesting that Nunami shrine is not in Konami as is it now, but it was in the east of Nonami. It would probably be fair to consider that over the long history, Nunami shrine was actually relocated from Nonami to the village in Konami. Bearing in mind that the names of ten shrines were accidentally lost during the compilation of the Fudoki, it's possible that that there actually two Nunami shrines in the Shimane district. 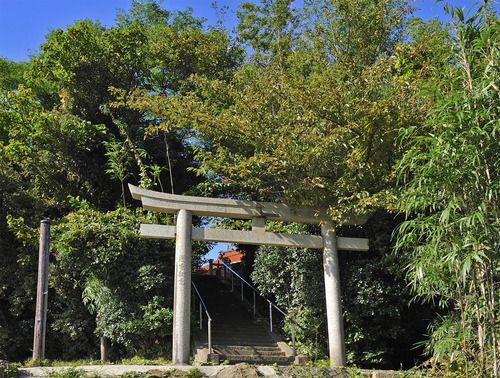 Nunami jinja is located on a hilltop on the east of the Konami bathing area. The shrine had an official ceremonial transfer of the deity to a new shrine in Heisei 13 (2001) and the newly dedicated parent/child Koma-inu shrine guardian dogs make quite an impression. Every February 11th sees the 'Ise-jingu sai' event at the small shrine (O-isesan) to the right of the Nunami jinja prayer hall. In days gone by, chief priest performs a ritual where several pieces of paper with different dates written on are placed on top of rice which is set on a Sanpou-small wooden table used in Shinto ceremonies. The Priest, using a Heigushi staff then selects one of the papers, the date selected is then supposed to be the best day for a bumper fishing haul. New Year at Konami sees a bustling children's O-mikoshi decorated with Toshitokisama. 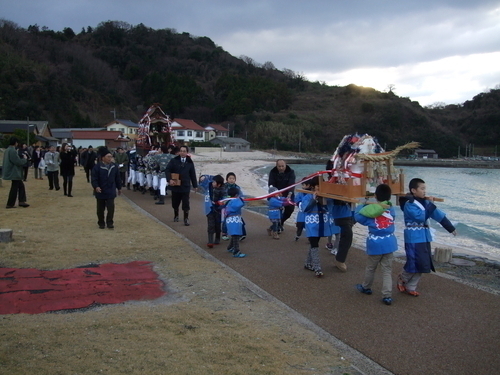 The O-mikoshi is launched into the sea for a Shinto cleansing ritual, but in recent times local wives have deemed it too dangerous to have their men immersed in the waters, so this no longer occurs. 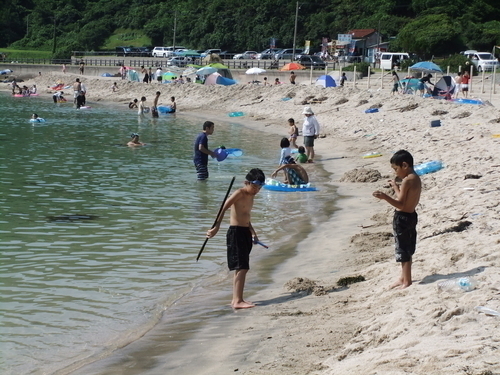 In the past at Konami bathing area, thanks to its shoaling beach, clams could be caught by the bucket-load. Unlike sazae (turban shells), it's not forbidden to fish for them, so hunting them can be a fun secret activity. It's said that if you bathe in these seas, you won't catch a cold for an entire year so it's well worth a visit along with your bucket and swimsuit. While there are hostels to stay in, nothing beats gazing at the summer night sky while camping. The hostel, "Nakayoshi", is of course, open during the summer, but providing reservations are made, meals can be arranged in the winter, too. Going back around 10 years, holidays by this sea experienced quite a boom among families following the appearance of Matsue resident and keen diver Sano Shiro on a TV show introducing Izumo mythology. Autographs and messages from related celebrities and visitors are still up in the dining area at Nakayoshi Lodge. Going back even further, Konami-ura was also used as a shooting location for the film "Hana Ichi monme", a drama about the strengthening of bonds between a family after overcoming a series of challenges. "When we walk along the shore, the sound of the tides moves our hearts as they remind us of our own pasts. When we walk along the shore, we are reminded of the nostalgia of summer days gone by." " As the old man in the town told us, gathered round the crackling fire, stories of old, the tanuki who turned into a man."